upper-level divergence appears to be very good for development. SST 30c plenty warm enough. for the period until midnight WST Thursday 23 November 2017. 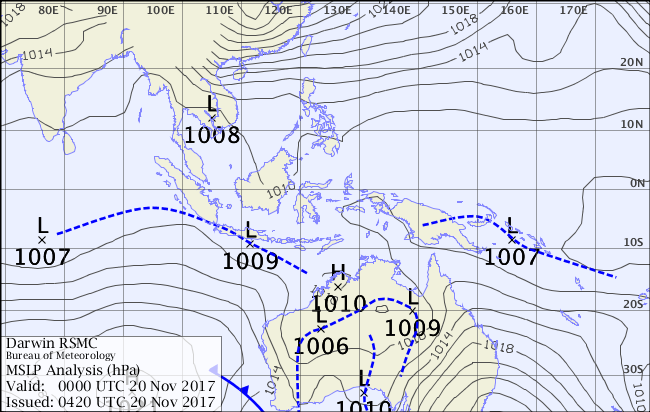 There are no significant tropical lows in the Western Region at present. A weak tropical low may develop in a trough just south of Indonesia over the next couple days and then linger or move slowly west. It is unlikely to develop into a tropical cyclone in the short term, but the risk increases for next weekend. EC going with a high chance of formation. CYCLONE WITHIN THE NEXT 24 HOURS REMAINS LOW. for the period until midnight WST Sunday 26 November 2017. 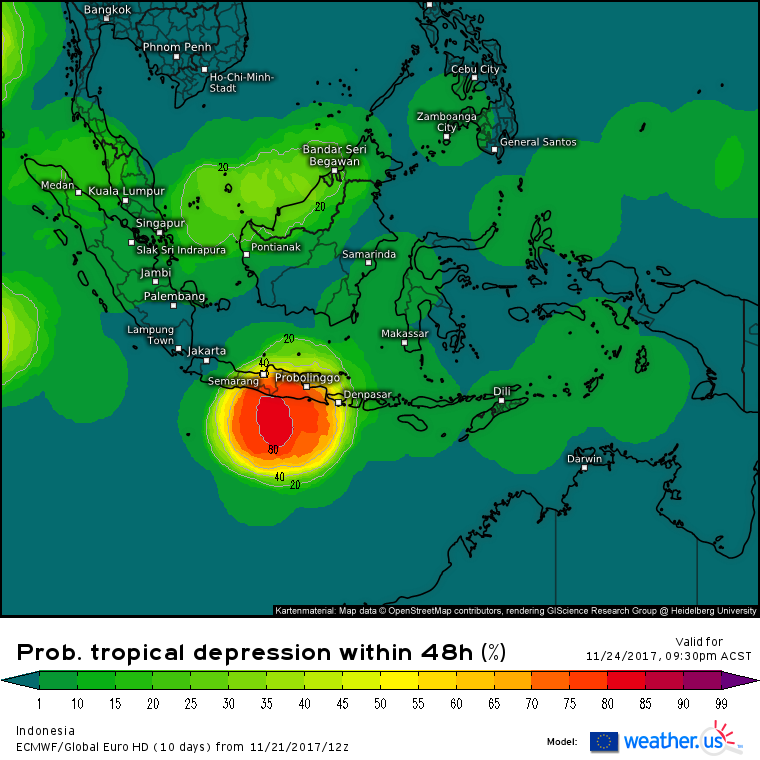 A weak tropical low lies near 10.4S 111.0E, approximately 240 kilometres south of Java, Indonesia. 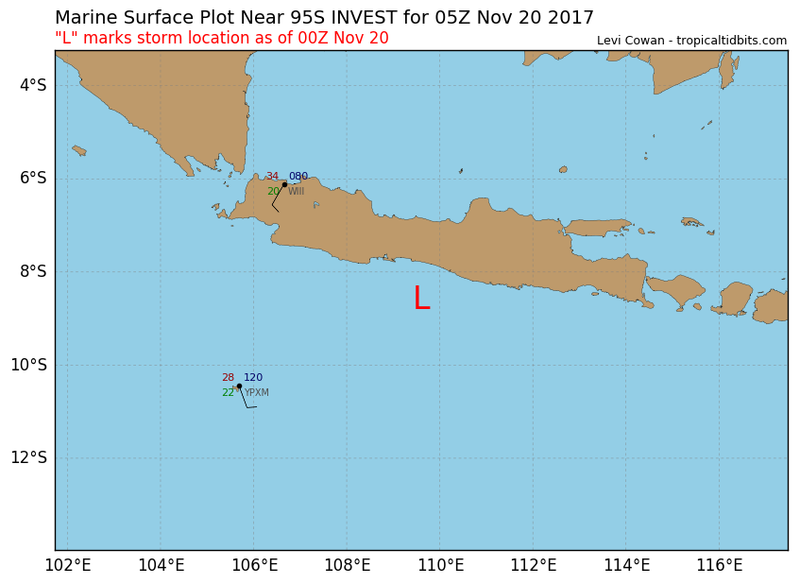 The system is expected to move slowly westwards during Friday and over the weekend before shifting back towards the east early next week, persisting over waters south of Java. This tropical low has only a slight chance of developing into a tropical cyclone over the weekend and early next week, well north of the Australian Continent. Real time wind map supports the BOM. Still has EC/GFS/CMC model support. 25/11 13.30 EDT slowly organising . for the period until midnight WST Tuesday 28 November 2017. A weak tropical low lies near 9.7S 109.5E, approximately 180 kilometres south of Java, Indonesia. The system is expected to persist in this general area over the weekend. It's motion next week is uncertain but is largely determined on its development. 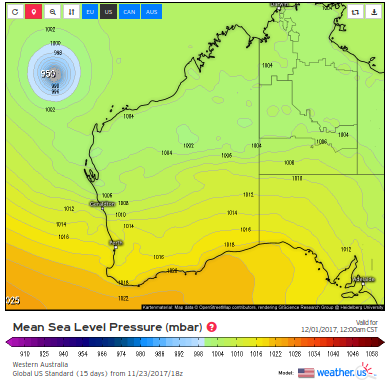 It has a Low possibility of becoming a tropical cyclone from Sunday with the risk increasing from Monday where it is likely to be located over open water well north of the Australian Continent. 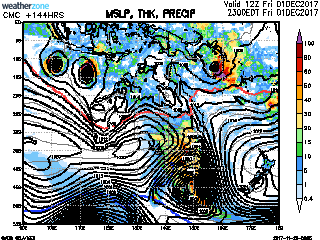 GFS 06 run strengthens this system to a gnarly 938 mb before weakening as it tracks towards a landfall. Has a neat looking fujiwara going on. Convention is firing up. Unfortunately there is no working noaa floater. 109.4E, APPROXIMATELY 230 NM SOUTHEAST OF JAKARTA, INDONESIA. The consensus within global models is apparent. - Medium to dense rain has the potential to occur in the southern part of Banten, southern West Java, Central and South Central Java, Yogyakarta, southern part of East Java. Yesterday's ASCAT indicated winds were already at least 25 kts. Looks like a TS now with 35-45 kt winds. Cempaka still has a very impressive microwave structure. Looks much better compared to infrared imagery. Shocked to see JTWC still calling it as an invest. 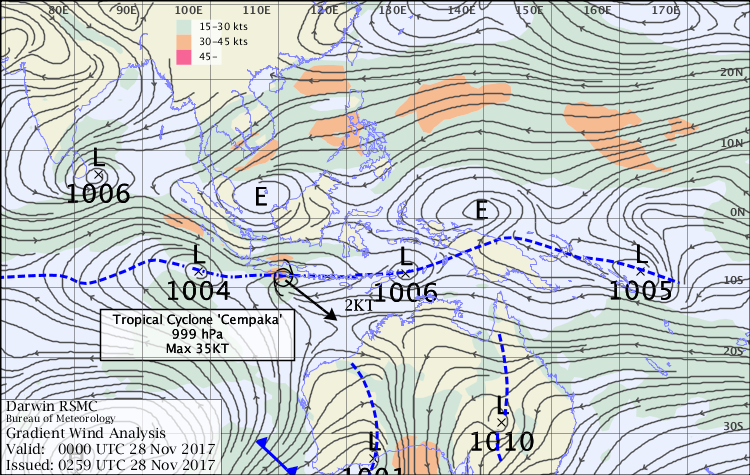 The first tropical cyclone in the southern hemisphere for the 2017-18 season, tropical cyclone Cempaka, was named by the Indonesian meteorological agency overnight on 27 November, and is currently located south of the Indonesian island of Java. Cempaka is embedded in a weak tropical trough which extends to a second tropical low further to its west. This second low is forecast to merge with Cempaka and slowly strengthen as it moves in a southerly direction. 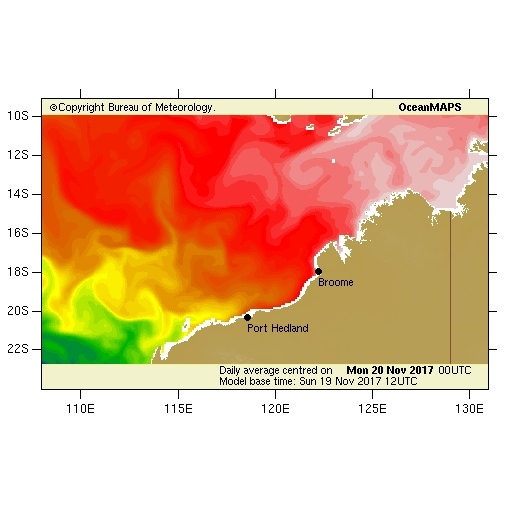 Current forecasts suggest this system may track towards the far western coast of Western Australia at tropical cyclone strength, but is unlikely to make landfall at tropical cyclone intensity. 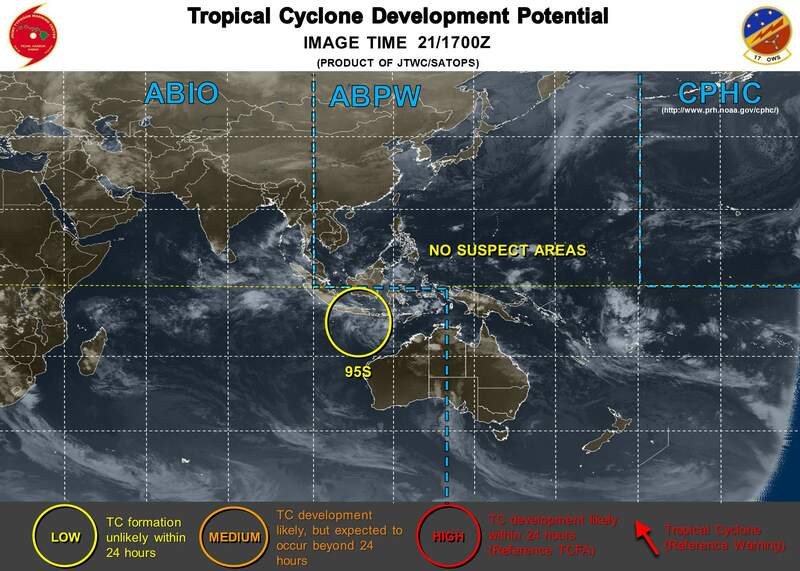 Further information on any tropical cyclones in the Australian Region can be found on the Bureau's Current Tropical Cyclones page. I think it either dissipated or moved ashore (and dissipated) last night. I can't find it on satellite and ASCAT indicates no LLC. Isn't this a rather unusual location for a cyclone? somethingfunny wrote: Isn't this a rather unusual location for a cyclone? Yes, it's quite far north. ASCAT doesn't indicate any LLC today. Nothing on satellite or microwave either. Yeah, really equatorial for a system in this region. Indonesia impacts are rare.